Above: In this kitchen, traffic flows around the central prep area, yet there is room for guests to interact with the cook(s). If food is the way to your heart, then all roads lead to the kitchen. Whether you’re an aspiring (or actual) gourmet chef or simply love to throw parties, the kitchen is the center of your guests’ attention. But creating the ultimate culinary space is tricky. Most kitchens have huge pain points. 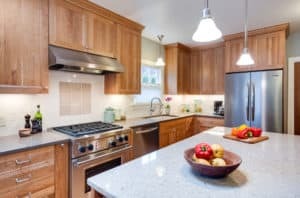 Whether your style is contemporary, transitional, traditional or shabby chic, the goal is to create a kitchen that works for your day-to-day activities, as well as holiday parties and weekend gatherings. 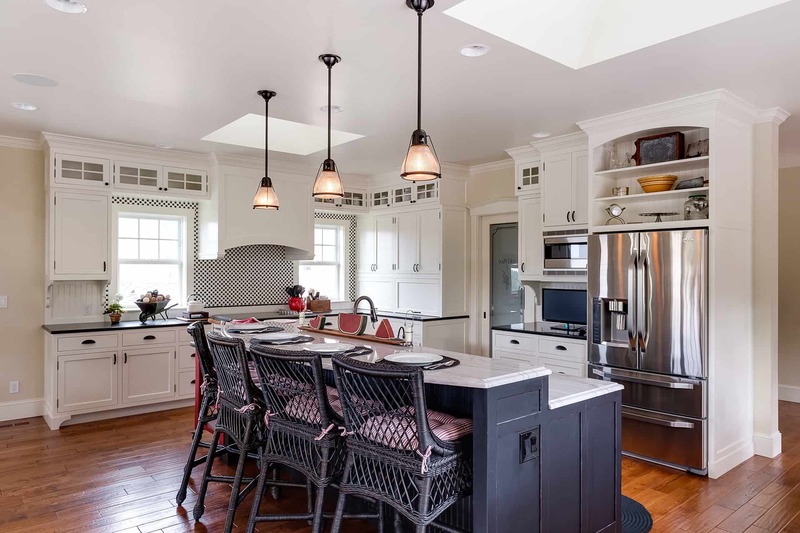 Provided are the top five remodel considerations for the ultimate cook and entertainer. The ideal flow of traffic is when a cook can move around the kitchen without having a guest or family member in the way. For a single cook, this means they can get food from the refrigerator, move to the sink to prep it, move to the range for cooking and then move to serving with a sense of connectedness. Above: An island increases the amount of surface space available in a kitchen. The more counter space the better for gourmet chefs and entertainers. To increase the flow of traffic, ensure there’s enough counter space between each appliance. Adding a second sink on a kitchen island or next to the refrigerator is ideal when a second cook is also working. The recommended height between your countertop and cabinet is 18” but custom fittings are ideal when you have larger appliances such as a Vitamix or espresso machine. A raised snack counter is an ideal solution for chefs that want to open up the kitchen to the living room, and provide additional seating. When choosing a snack counter, ensure there’s enough room for an entire place setting. Proper lighting and outlets will help keep you safe and efficient while cooking. When examining the number of outlets you need, take into consideration how many electric appliances you regularly use, and whether or not you store them permanently on the countertops. “The goal is to have your house set up where you can live in it, work in it and walk through it without annoyances,” says Richmond. 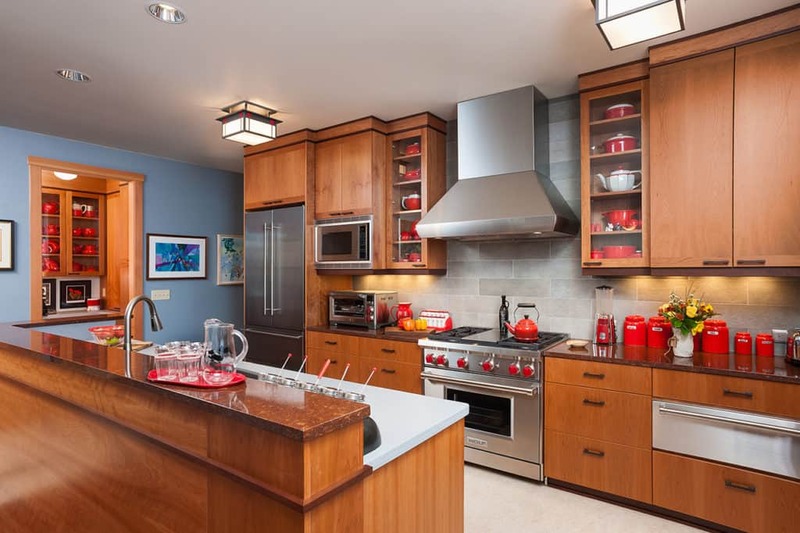 Above: Ample storage space is a feature of this kitchen design. The sky’s the limit with kitchen appliances. From double ovens and stoves, warming drawers, built-in refrigerators and more, the key to appliances is ensuring each tool has enough surrounding space to prep and display food once it’s finished. Are you ready to create the kitchen of your dreams? Schedule a consultation with Neil Kelly’s design/build remodel team to create a space that’s both inviting and hardworking — a space that’s truly the heart of your home.